CW3E project scientist Kristen Guirguis, and co-authors Alexander Gershunov, Rachel Clemesha, Tamara Shulgina, Aneesh Subramanian, along with CW3E director Marty Ralph, have recently published a paper in Geophysical Research Letters entitled “Circulation Drivers of Atmospheric Rivers along the North American West Coast” (Guirguis et al. 2018). In the study, researchers analyzed a seven-decade-long catalog of atmospheric rivers impacting western North America to quantify synoptic influence on AR activity. Using Empirical Orthogonal Function analysis, the researchers identified 15 modes of atmospheric variability over the North Pacific. 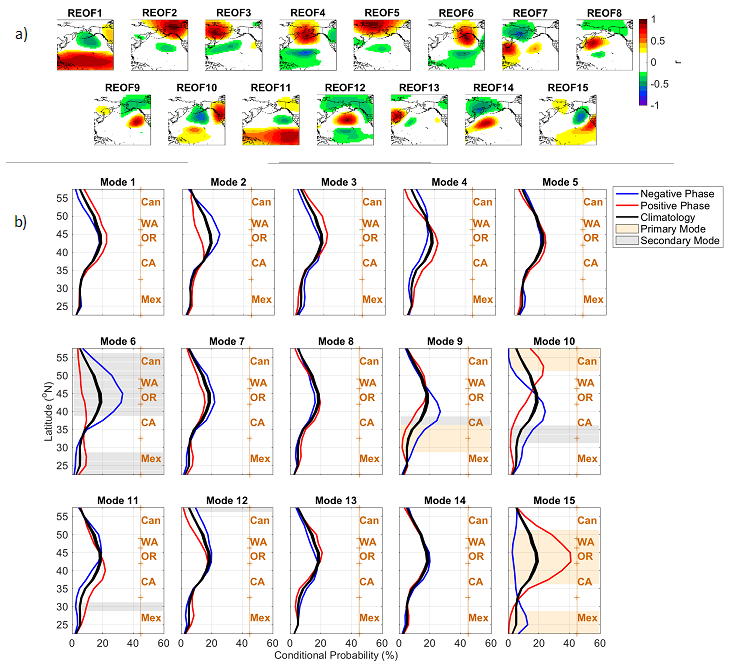 From these modes, they identified the subset of variability patterns that exert the most influence on AR frequencies for particular locations along the West Coast. Their findings revealed that the bulk of AR landfalls along the West Coast are associated with only a handful of influential circulation features, which has implications for S2S predictability. Specifically, the four most influential patterns were identified as a pressure anomaly in the Gulf of Alaska (mode 6), a pressure anomaly off of California’s shore (mode 9), a Canadian-Pacific dipole pattern (mode 10), and a Baja-Pacific dipole pattern (mode 15). The researchers also demonstrated how the interaction between these modes creates favorable or unfavorable atmospheric states for landfalling ARs at different latitudes, where different combinations of modes effectively direct IVT plumes to different locations along the coast. For example, when two modes are in-phase, the resulting circulation favors onshore flow directed at a particular latitude, which is favorable to AR landfalls. Conversely, these modes can also align in a way that makes AR landfalls unlikely. 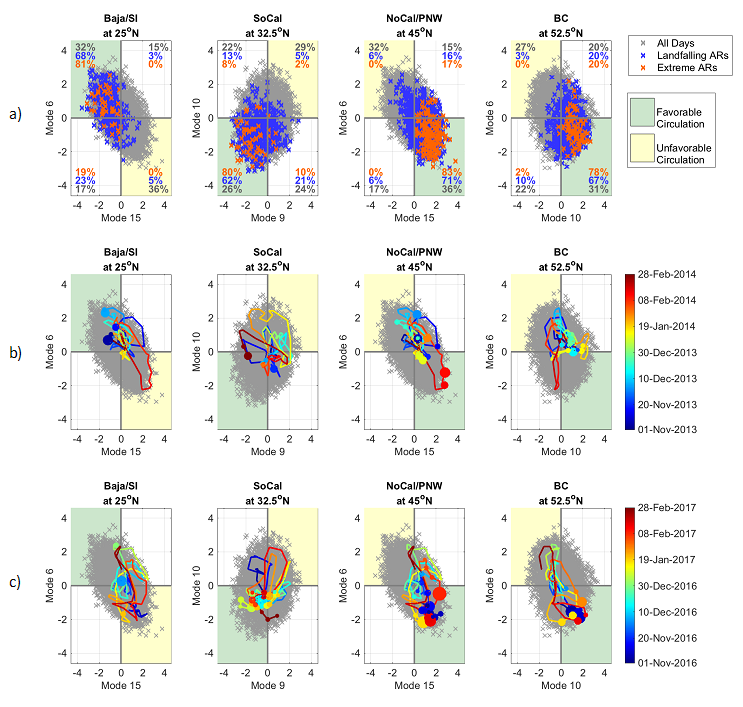 By analyzing the entire record, the researchers found a strong relationship between the seasonal persistence of certain mode phases and interannual variability of landfalling ARs, including recent California drought years and the wet winter of 2016/2017. Figure 1: (a) The first 15 rotated EOFs representing different circulation patterns shown in their positive phase. (b) Conditional AR landfall probability associated with the positive (red) and negative (blue) phase of each of the 15 patterns for different coastal latitudes, where positive/negative phases are defined as 0.5 standard deviations above/below the mean, respectively. Climatological AR probability is shown in black. Orange (gray) shading identifies the primary (secondary) modes of influence for each latitude. The vertical bar along the y-axis gives country and state boundaries (Mexico, California, Oregon, Washington, Canada). Figure 2: Phase diagrams showing how mode interaction affects AR activity. (a) Strength of the primary mode (x-axis) plotted against the secondary mode (y-axis) for a given latitude for all historical days (gray), AR days (blue), and extreme AR days (orange, defined as AR IVT above the 90th percentile). AR activity is concentrated in one quadrant (“Favorable Circulation”, shaded green) and AR activity is reduced in the opposite quadrant (“Unfavorable Circulation”, shaded yellow). Numerical text gives the percent of days in each quadrant for all days (gray), AR days (blue) and extreme AR days (orange). (b) and (c) show the phase evolution for 2013/2014 and 2016/2017, respectively. The color scale gives the date and circular markers identify ARs with the size weighted by local IVT magnitude. Guirguis, K., A. Gershunov, R.E.S. Clemesha, T. Shulgina, A.C. Subramanian, and F.M. Ralph, 2018: Circulation drivers of atmospheric rivers at the North American West Coast. Geophys. Res. Lett., 45, https://doi.org/10.1029/2018GL079249.